I was excited to see a new book by Leslie Tentler after having enjoyed her Chasing Evil trilogy. And so I'm also hoping that there will be more to come, whether within the scope of Fallen's world or even adding onto the people surrounding Tentler's first three books. However, seeing as how those three books only really tied into each other with one mutual acquaintance in the FBI who was only ever mentioned by name, I doubt we'll see much of either Ryan or Lydia in future books. I'd been looking forward to another good romantic suspense slash crime thriller slash murder mystery to immerse myself in--like an actual murder mystery and not just a romantic suspense where you already get introduced to the killer after the first quarter of the book passes. So Fallen delivered delightfully what I was looking for, so I was gratefully happy. 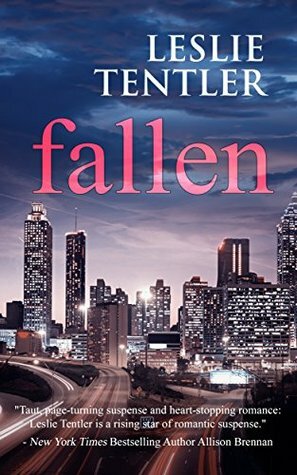 There is a cop killer striking down in Atlanta and as far as lead detective Ryan Winter can see, there seems to be little connection to go on save for their keyed cars, missing badges, and the fact that each officer was shot by the same gun. The book turned out with a feeling of crime thriller and a side of quiet contemporary melodrama, though, and there were parts that might have dragged on a bit. Aside from the central murder investigation, we're also dealing with Ryan and his ex-wife, Lydia Costa's personal tragedy that is still lurking in the background--the death of their son that had ended up tearing their marriage apart. In the long run, I still enjoyed this book a lot, got caught up in the suspense and the action, and had some hopes of seeing some minor characters in their own stories later on... if it happens. I enjoyed the presence of Ryan's brother, Adam, who is a uniformed patrol officer, though I doubt there will be a book covering him since his anecdote in the background feels pretty final. Our main couple, Ryan and Lydia, were enjoyable together, but the angst might have been a bit much for me to handle. On the upside, the police work converging with hospital activity was quite well done and I have to say that the setting of all of it was what I liked best--there was always something happening when we weren't getting caught up in the backstory of Lydia's and Ryan's quiet melo tragedy. Life didn't stop happening in the background to accommodate following the main characters' current story line. Even with the main murder investigation taking place, you still get to see police life and hospital life continuing with other cases stacked on top of the current story line case. Ryan and his partner make headway in a different homicide, even though we don't really get to see the resolution of it. Final Thoughts: Very enjoyable and great for a rainy-day read. That's great when you find the type of book that you're in the mood for. It sounds like a suspenseful read. Too bad there was a bit too much angst.